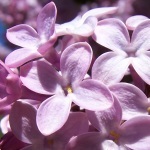 Common lilac is a native of the northern Balkan Peninsula. Around 1560, the German ambassador in Constantinople sent some specimens to Vienna, and the culture quickly spread to the rest of Europe. Like jasmine, lilac belongs to the olive family. 1,4-dimethoxybenzene (hydroquinone dimethyl ether) and indole. 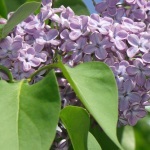 In fact the diffusive aura of lilacs in full bloom is highly influenced by the compound benzyl methyl ether. This simple but rare chemical has an intense fruity-etheral odor, reminiscent of the top note in ylang-ylang oil. Minor constituents of the lilac headspace are anisaldehyde, 8-oxolinalool, cinnamic alcohol and elemicin   . Etymology: Gr. syrinx, tube or flute, because of the hollow, marrow-filled branches; Lat. vulgaris, common. P.S. As almost nothing is published on benzyl methyl ether, a note may be relevant concerning the small-scale synthesis of an olfactory pure quality of this odorant. Although the straightforward method would be from benzyl chloride and a surplus of methanolic sodium methoxide, this results in a product contaminated by an obnoxiously smelling impurity. Instead, benzyl alcohol should be methylated in methanol under mild conditions using an acidic catalyst and a water-removing agent (personal experiments). P.P.S. 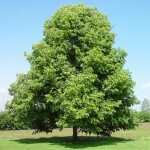 The so-called syringaldehyde or syringic aldehyde, which is 4-hydroxy-3,5-dimethoxybenzaldehyde, is derived from the glucoside syringin, first isolated from lilac bark. Apparently it is of little importance in the headspace of lilacs. 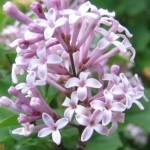 Another lilac worth mentioning is the dwarf lilac, Syringa microphylla, (above) which has its natural habitat in dry and light-open oak and pine woods in northern China. 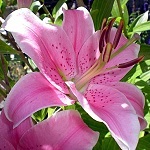 It is now introduced in many temperate gardens. 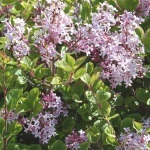 Its intensely fragrant flowers has a sharper but fresher odor than common lilac - in the direction of privet. 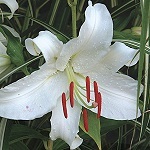 Lilium orientalis (Liliaceae) cv. "Casa Blanca", "Sorbonne", "Yelloween"
Cis-ocimene and linalool were the major terpenoids in all varieties. 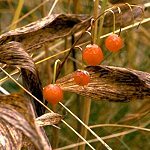 Major compounds common to two or more varieties were: 1,8-cineole, benzaldehyde, methyl benzoate, ethyl benzoate, creosol and isoeugenol. "Sorbonne" had acetophenone as a special component, "Yelloween" was characterized by high amounts of phenylacetaldehyde and phenethyl acetate, and L. longiflorum by a high level of the sesquiterpene alcohol nerolidol . 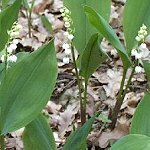 Lily-of-the-valley is a flower of the forest-floor on poor and calcareous soil. In Scania in southern Sweden, for example, it is found in dense stands close to the bed-rock. Lily-of-the-valley is widely distributed in the northern hemisphere. The whole plant is poisonous. 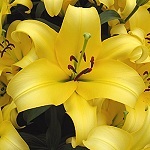 The intense and elegant fragrance of the flowers may be described as "delicately floral, with a distinct touch of greenness, surrounded by fresh, rosy-lemony nuances" (Kraft et al.) . (0.18 %), green pea and galbanum-like notes: 2-isopropyl-3-methoxypyrazine (trace) and 2-isobutyl-3-methoxypyrazine (trace), fatty, waxy, aldehydic notes: octanal (0.15 %), nonanal (0.1 %), decanal (0.07 %) and fruity, raspberry notes: beta-ionone (trace). 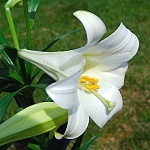 In another study of lily-of-the-valley, phenylacetaldehyde oxime was identified . Etymologi: Lat. convallis, valley; Lat. majalis, belonging to May or blooming in May. 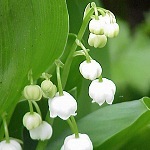 In France lily-of-the-valley is called muguet. Already in 1908 it was discovered that the compound 3,7-dimethyl-7-hydroxyoctanal or hydroxycitronellal has a beautiful lily-of-the-valley-like odour. This famous odorant is used in countless perfumes for this nuance. Unfortunately it is rather unstable and has shown up to be slightly allergenic, so its use level is restricted. Alcohols are more stable, and a number of successful alternatives have been developed, Mayol ® and Florol ® being examples . 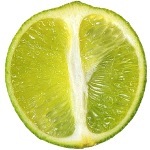 The little green lime fruit resembles lemon, but is more intense and aromatic. 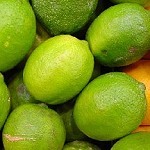 Yearly, more than 1000 tons of the so-called 'Distilled West Indian Lime Oil' (the main ingredient of Coca-Cola aroma!) is produced by steam distillation of the juice-and-oil emulsion from the chopped fruits. Lime oil produced this way contains a number of artifacts, compounds arising from the influence of acidic juice components upon the (+)-limonene, linalool and citral of the oil, for instance 1,8-cineole, 2,2,6-trimethyl-6-vinyltetrahydropyran and 2-(2-buten-2-yl)-5,5-dimethyltetrahydro-furan. These compounds contribute to the typical aroma of distilled lime oil . Characteristic of lime fruit peel oil is the woody smelling germacrene B and the sweet smelling 7-methoxycoumarin  . In Denmark, the lindens of the cities are mostly T. europaea, a crossing between T. cordata and T. platyphyllos. In southern Europe they are predominantly T. platyphyllos. However, the separate species may be hard to distinguish. 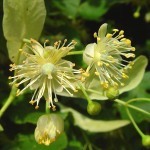 The airy, honey-green fragrance from the large, blooming trees brings a magic refreshment to the warm summer-breeze. Bees and other insects love the nectar of the lindenblossoms, placed in the sepals of the hanging flowers, protected from rain. The dried flowers make a delightful tea. 3-(4-methoxyphenyl)-propanal and the corresponding alcohol . 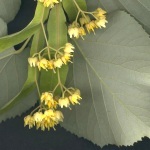 The flowers of the Silver Linden, Tilia tomentosa, (above) from South-Eastern Europe, have a more powerful and substantial honey-sweet odour than those of the above species. 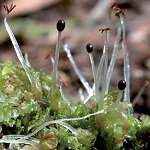 The class of bryophyte (moss) plants called liverworts (Marchantiopsida) numbers 6000-8000 species! They are distributed globally in almost every available habitat, but most often in humid locations. 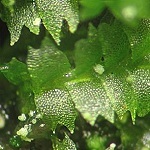 Liverworts are characterized by cellular oil bodies and often have distinctive smells when crushed, e.g. intensely sweet-woody, intensely turpentine-like, strong milk-like, sweet-mossy, fungal-like, carrot-like, mushroomy or seaweed-like scents. Thus the crestworts (Geocalycaceae) typically have a strong and aromatic moldy (mossy) smell due to a mixture of (-)-geosmin, (-)-2-methyl-isoborneol and various sesquiterpenoids   . 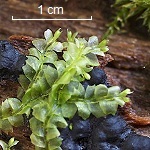 A common member of this family is the variable-leaved crestwort (photos) which is common in temperate zones on the base of trees, rotting log, fallen twigs and litter in woodland. Etymology: Liverwort, from the cellular pattern of the thallus of genus Conecephalum which is reminiscent of hepatic lobules.